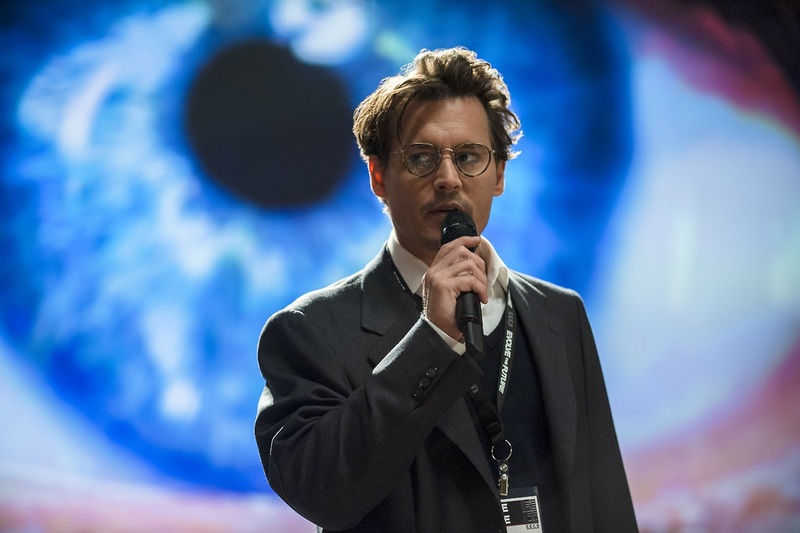 As a wildly condensed version of The Lawnmower Man coupled with a subtle nod to Invasion of the Body Snatchers, Transcendence stood out in my mind for one true reason: Johnny Depp's latest release is one in which he plays a character that is a completely normal person. He doesn't have a weird accent, doesn't wear an outrageous costume, and for the most part, looks about as recognizable as if he was signing autographs on the street (except for a couple of scenes in which he sports some foul pigmentation in his skin and a bad, computerized perm). I mean, as a scientist who looks into changing artificial intelligence for the better, he channels about as normal a dude as when he played a mild mannered banker in 1995's Nick of Time. Having a premise that has straight-to-DVD written all over it and penned by a first time screenwriter (Jack Paglen), Transcendence begins with a confusing aftermath scene showing what looks like San Francisco, California in a sort of tragic desolation. The film then backtracks five years earlier where we have doctors Will and Evelyn Caster (played by Johnny Depp and Rebecca Hall) speaking at a convention to potential sponsors concerning a concept called technological singularity (the point where artificial intelligence will surpass human intelligence). After the lecture ends, we have Caster (Depp) signing a book he wrote when he's shot by a bullet that eventually gives him radiation poisoning (thereby leading to his death). Here's where things get interesting: when Depp's character dies, his brainwaves stay afloat and embed themselves in a computer. Whether what image on said computer is Caster or not (we know that it at least looks like Depp), we find out that this presence can read thoughts, calculate vital signs without touch, and heal people only to turn them into zombies. As the movie causes the audience to partake in a moral tug of war concerning the sanctity of human life, two FBI agents (Christopher Nolan alum Cillian Murphy and you guessed it, Morgan Freeman) are on the case trying to destroy Caster's catatonic empire. Wally Pfister is in charge of this sometimes, sci-fi snoozer. He films with a paint-by-numbers method in terms of the visual palate and Transcendence is his directorial debut. He's a gifted cinematographer who has shot a lot of Christopher Nolan's work (Inception, The Dark Knight, The Prestige). I expected his first foray into film making to resemble Nolan. However, he directs Transcendence as if Ridley Scott were at the wheel. What's on screen feels like a mash up of The Counselor (if The Counselor were science fiction) and Scott's silvery 2012 release, Prometheus. And although the sun is shining for pretty much the bulk of its 2 hour running time, Pfister seems to have an obsession with filming the slow motion apparatus of rain drops (it's a metaphor for Transcendence's moral reasoning and it seems overused). Then there is the acting which is for lack of a better word, disappointing. I mean, this is a strong cast and most of them seem lost within the material. They do what they can based on the requirements of the plot. And the silly, sci-fi mumbo jumbo in the script certainly doesn't help them get ahead. Rebecca Hall as Depp's character's wife, overacts at every turn and has poor, unclear character motivation. Morgan Freeman who appears in everything these days, gets another nothing role playing an FBI agent (at least he gets to speak and Freeman's voice in any film is a sure mainstay). Paul Bettany (Max Waters) probably gives the best performance as Caster's best friend, confidant, and mentor. But just like everybody else, he goes through the motions just trying to get through the film without really knowing what the heck is going on. Finally there's Depp. I mean, I have always thought of Johnny Depp as a superior actor but this role is way too easy for him (he pretty much sleepwalks through it). I saw an interview where he says that he doesn't like to watch his own movies. That's a good thing because if he actually saw Transcendence, he'd say to himself, "oh well, at least I got paid handsomely". In the end, Transcendence has some genuine moments but it just doesn't feel that compelling. It doesn't "transcend" into anything awful but it comes off like more of the same when placed into today's modern era of sci-fi film making. Sadly, it's a product that is polished up and completely shipped out. In essence, Hollywood just keeps trying to reinvent the wheel when it comes science fiction. Transcendence just becomes another spoke in that tattered wheel.